With over 259 million members and growing at rate of two new members per second, Linkedin is the premier business social network and there are many reasons that I believe it is in your best interest to set up a profile and get a company page for your farm and/or business. If you want to link up with me, here’s my Linkedin Profile. Most complaints I get about social networking is that most of the content seems silly like on Facebook (I don’t care what my high school classmate is doing right now) or on Twitter (I don’t care what you had for lunch or that Justin Beiber said). Linkedin is mostly straight business talk – current headlines are issues effecting the economy or an article about how to retain employees. 2. Where are all the farmers? There is a serious lack of farmers on Linkedin. Many thought leaders and business influencers are talking back and forth on the network but not with farmers. If you want to join their conversations, Linkedin is a great place to do it. You have your personal network of business associates but I’ll bet that no one besides yourself really knows who those people are. If you connect with them on Linkedin, you might open the door to someone you know to connect. For example: Linkedin is a great place for people to search for jobs. Maybe your son or daughter is looking to work at a business and has no idea that you know people that work there. But if you were connected in Linkedin, they would know for sure and would be able to work through you to get connected to the right people in that business. Don’t you hate it when you go to find someone’s number off a business card and that number is no good anymore? 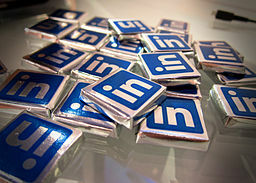 If you connect with them on Linkedin, then they update their profile information and you can always be connected with them. When it comes to someone searching for your name or farm, you want the good stuff about you to show up first. When you set up a profile for yourself and your farm/business page, there’s a good chance it will pop up on the first page of your search results. This is a good way to control what people see when they look for you. Sometimes you get busy doing work and don’t have the time to meet new business acquaintances – Linkedin is a great place to meet legitimate business people with likeminded interests. You can do this through joining groups and being a part of their conversations. You can even tailor your news settings and Linkedin will send you business news set up strictly to your tastes. Don’t miss out on the opportunity to grow your influence and strengthen your business connections for the benefit of your business and your family. With my next post, I’ve gone through the step by step instructions on how to set up your Linkedin profile and company page. Are there any reasons that you joined Linkedin that I missed? Let me know and I’ll add them.